It’s true isn’t it? If you add enough pressure to anything, eventually it will break. With that being said, that very same pressure can also create diamonds. In the case of WBC Heavyweight champion Deontay Wilder, (40-0-1, 39 KOs) Lineal champion Tyson Fury (27-0-1, 19 KOs) and unified belt holder Anthony Joshua (22-0, 21 KOs), they all share an enormous amount of pressure. These three men are undoubtedly the very best that the Heavyweight division has to offer but how exactly should they be ranked? Deontay Wilder is the longest reigning title holder of three having held his title since 2015. How about Joshua? He does hold the IBF, WBA, WBO and IBO titles. He also has faced the better opposition of anyone else in the division. Fury may have the best claim to being the divisions best as he is the man that beat the man. In late 2015 he shocked the world in defeating Wladimir Klitschko and ending his nearly ten year reign. The best way to end the debate is to simply have them face off with one another. 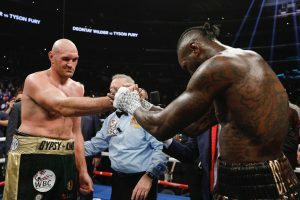 Wilder and Fury waged war on one another when they met in the ring on December 1st 2018. It was a fight that saw Fury outbox Wilder for the vast majority of the contest but the WBC champion managed to score two knockdowns including a dramatic one in the 12th and final round. The final call was a draw. It left fans salivating for the sequel. Unfortunately as is the case most times in boxing the rematch was shelved. Although Joshua has yet to step into the ring with either man he has routinely faced stiff competition. Alexander Povetkin, Dillian Whyte, Wladimir Klitschko, Joseph Parker and a slew of other top contenders have all fell by the way side when matched up with Joshua. It seems as though these three fighters are joined at the hip. That trend continues as they will grace the ring within a short amount of time of one another. Wilder will have his WBC title on the line when he takes on mandatory challenger Dominic Breazeale on May 18th. Joshua will make his U.S debut on June 1st at Madison Square Garden against the unbeaten Jarrell Miller while Fury will travel to Las Vegas on June 15th to take on the relatively unknown Tom Schwarz. The longer these fighters don’t step into the squared circle with one another, the more the pressure to win will mount. Not only do they need to win but they also need to do in so in dominant fashion. With the talent that currently presides in the Heavyweight division, it just takes one bad night from any of those three champions that could ultimately lead to a loss. The fans shudder to think of such an upset. Anthony Joshua, Deontay Wilder and Tyson Fury are great champions. Who is the best from this group will be discovered soon enough as they will face each other at one point in their careers. However until that time comes they all must continue to win. The question now is, will these fighters allow that pressure to break them and lead them to a loss before they get matched up with one another or will they thrive off that pressure and continue to win? Only time will tell.